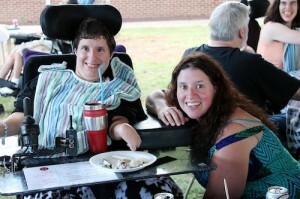 Adult patient Jessica Evans, left, with her twin sister Jami Nuesch. Family Day at Matheny is special. It’s an opportunity for parents and other relatives of our students and patients to visit, enjoy food and beverages prepared by the Matheny staff and relish the end of summer outdoors. Fortunately, the weather cooperated again this year, and some families were able to cool off in our swimming pool. Thanks to the social services staff for hosting this event and to the Matheny dietary staff for preparing all the great food! Student Tammy Boszczuk and her twin sister Tara. This entry was posted in Uncategorized and tagged Family Day. Bookmark the permalink.